The U.S. economy is on track for another solid quarter after the fastest growth since 2014, with upbeat consumers in the driver’s seat and factories providing support even amid trade headwinds. 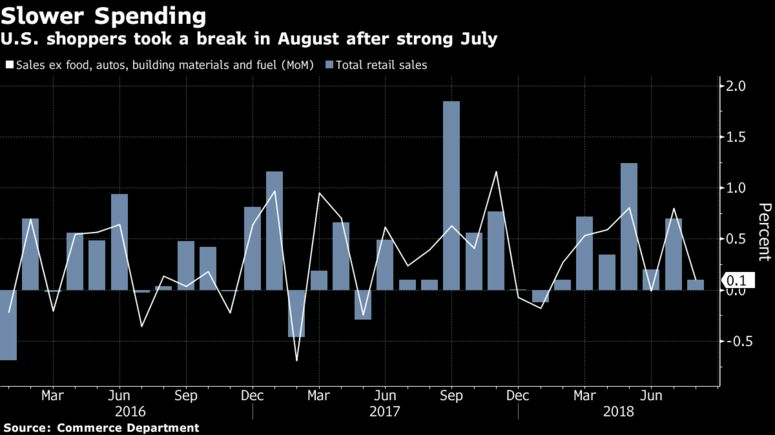 Data released Friday showed shoppers took only a slight breather in August after a bigger spending spree at retailers and restaurants in July than previously reported, while gains across manufacturing, mining and utilities pushed up industrial production last month. Another report showed consumer sentiment hit a six-month high in September. While retail purchases and factory output were below the median forecast of analysts surveyed by Bloomberg, the broader picture indicates the economy is so far withstanding headwinds including the trade warinstigated by President Donald Trump. Following Friday’s data, some economists raised forecasts for household spending, the biggest part of the economy, amid expectations that overall growth will cool only gradually from last quarter’s pace and the Federal Reserve will go ahead with an interest-rate hike this month. “If I look at the consumer, they’re on even footing,” said Tim Quinlan, senior economist at Wells Fargo Securities in Charlotte, North Carolina. “Manufacturing is on solid footing,” though “it’s hard to be able to give an unqualified thumbs-up to today’s data” because it fell short of estimates. The Commerce Department retail figures showed that so-called control-group sales — which exclude food services, auto dealers, building-materials stores and gasoline stations — advanced 0.1 percent after an upwardly revised 0.8 percent gain. The median estimate was for a 0.4 percent increase. The details were more encouraging, as nine of the 13 broad retail categories showed increases, while declines in automobiles and clothing dragged down the tally. Combined results from July and August indicate support from a strong job market and more after-tax pay during the back-to-school shopping season. Barclays Plc analysts put their gross domestic product tracking estimate at a 3.2 percent annualized gain for this quarter, up from 3 percent before the Friday release of retail sales and industrial production data. The economy grew at a 4.2 percent pace in the April-to-June period. JPMorgan Chase & Co. economists raised their quarterly consumer-spending forecast to a 3.6 percent increase, from 3.2 percent. Retail results may keep getting a boost from consumer sentiment. A University of Michigan report showed Americans grew more optimistic about the economy in early September, with a gauge of expectations rising to a 14-year high. Inflation expectations in the survey for the year ahead fell to 2.8 percent from 3 percent in prior month, while the inflation rate over the next five to 10 years was seen at 2.4 percent compared with 2.6 percent in the August poll. Those views follow a cooling of price gains seen in the consumer price index released Thursday. Other inflation data from the Labor Department on Friday showed prices for goods imported by the U.S. fell in August by the most in more than two years amid global trade tensions and a strong dollar. The rise in factory production in August, reported by the Federal Reserve, reflected broad-based gains that included automakers, primary metals and machinery and the boost from this year’s corporate tax cuts. The advance probably signals resilience in the face of supply constraints, higher input prices and uncertainty amid global trade uncertainty. Economic data, including on retail sales, may be distorted in coming months depending on the extent of damage and flooding from Hurricane Florence in the southeastern U.S.